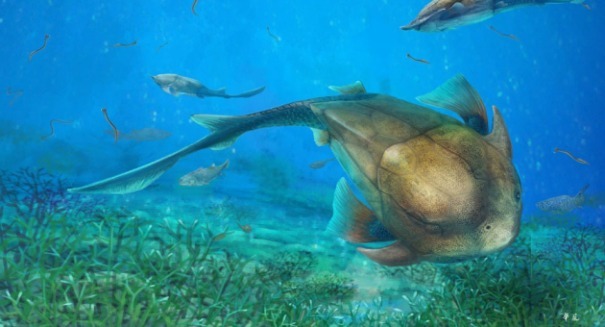 Scientists say a 423 million year old fish gave humankind this very important feature. A new discovery from scientists in China sheds light on the shocking truth about how we evolved over the many eons of mankind’s history. Scientists think our jaw is the result of an evolutionary journey that began 423 million years ago with an ancient fish. Our jaws have a special feature that allows us to chew that scientists now think can be traced to an extinct fish known as a placoderm. Before this discovery, researchers believe that our jaws had evolved separately because of our complete lack of resemblance to these ancient fish, but that is actually not the case, the study found, according to an Uppsala University statement. To come to their conclusions, researchers at the Chinese Academy of Sciences in Beijing compared a fossil from the ancient fish, which was discovered just three years ago, and a new fossil that was found in the same place. They found that the Entelognathus fossil – the one found in 2013 – is actually the most primitive vertebrate to have this modern jaw.